Websites, tools, and other resources to support development and adoption of environmental flow standards as mandated by Senate Bill 3, 80th Legislature. 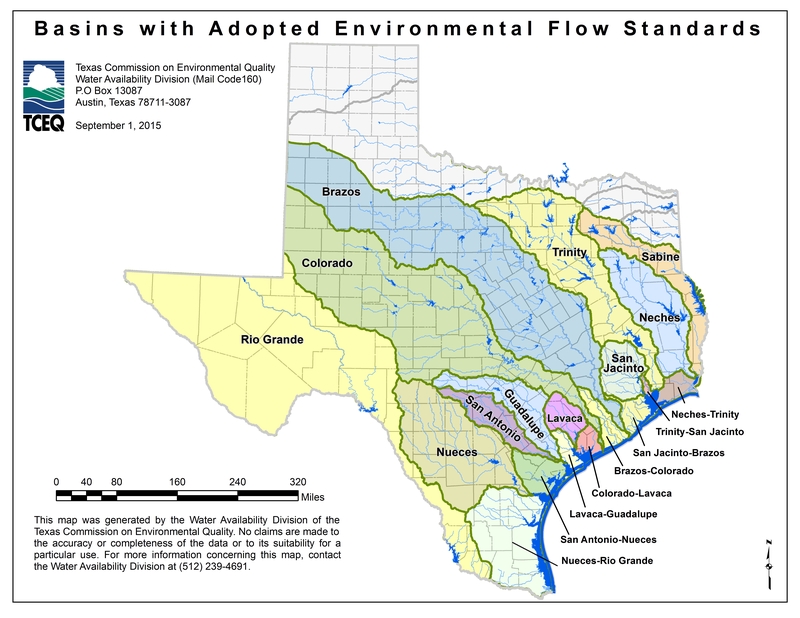 House Bill (HB) 3 and Senate Bill (SB) 3, 80th Legislature, 2007, require the Texas Commission on Environmental Quality (TCEQ) to adopt environmental flow standards for the river basin and bay systems in the state. HB3 and SB3 did not specifically name the Cypress Basin; however, the legislation does allow, in unnamed basins, efforts to develop information on environmental needs and ways those needs can be met by a voluntary consensus-building process. On November 16, 2010, the staff of the TCEQ held a stakeholder meeting to discuss the environmental flow process for the Cypress Basin. The meeting allowed stakeholders an opportunity to provide informal comments to staff on the environmental flows process. See the Agenda, Issues Discussed, and Public Notice for that meeting. For more information, contact the Water Availability Division at 512-239-4691 , or e-mail us at wras@tceq.texas.gov. Section 11.0236 of the Texas Water Code (TWC) specifies that each basin and bay expert science team (BBEST) shall develop environmental flow analyses and a recommended environmental flow regime for the river basin and bay system for which the team is established. The TWC also specifies that the flow analysis and flow regime be developed through a collaborative process designed to achieve a consensus. In developing the analyses and recommendations, the science teams must consider all reasonably available science, without regard to the need for the water for other uses, and the science team's recommendations must be based solely on the best science available. To assist the BBESTs with this effort, this website has been developed to serve as a repository of studies and ongoing projects that may be useful to the BBESTs in the development of environmental flow recommendations. Staff from the Texas Commission on Environmental Quality (TCEQ), Texas Parks and Wildlife Department (TWDB), and Texas Water Development Board (TWDB) are available to provide technical assistance to each BBEST. The Hydrology-Based Environmental Flow Regime (HEFR) methodology consists of statistical calculations of hydrologic data for the purpose of populating a preliminary flow regime matrix. Such hydrologic data analysis is an important first step in developing an environmental flow regime, but provides only an initial estimate of flow requirements. These hydrologic analyses should be complemented with overlays addressing water quality, biology, and geomorphology. All current HEFR and FRAT files, including documentation and supplemental spreadsheets, are included in a single bundle entitled the HEFR-FRAT Toolset. These files supersede previous versions. See the revised environmental flows timeline. Texas Instream Flow Program Home Page: This website includes information on current Instream Flow studies, upcoming meetings, and how to become involved with the TIFP. This website contains information on the Texas Freshwater Inflows Program, a data collection and analytical study program focused on determining the effects of and needs for freshwater inflows to the state's bays and estuaries. The website includes program background, sescribes the State Methodology, and provides links to completed reports for the major bays and links to data sources. TPWD Coastal Bay and Estuary Inflows: Synopsis of the 1994 publication: Freshwater Inflows to Texas Bays and Estuaries, William Longley editor. Indicators of Hydrologic Alteration (IHA): Software for Understanding Hydrologic Changes in Ecologically-Relevant Terms: IHA is a software program that assesses 67 ecologically-relevant statistics derived from daily streamflow records. For instance, IHA software can calculate the timing and maximum flow of each year's largest flood or lowest flows, then calculates the mean and variance of these values over some period of time. Comparative analysis can then help statistically describe how these patterns have changed for a particular river or lake, due to abrupt impacts such as dam construction, or more gradual trends associated with land- and water-use changes. Hydroecological Integrity Assessment Process (HIP) for Texas: USGS has developed a suite of software tools for Texas, a Stream Classification Tool for Texas (TxSCT) using 297 stream gauges with unaltered periods of record, and a Hydrologic Assessment Tool for Texas (TxHAT). The resultant four stream types are each associated with a unique set of ten, non-redundant, hydrologic indices that can be used for further analysis. The SCT can be used to classify any period of record from any gage in the state. Hydrologic behavior of gauged flow can be analyzed using any of the 171 indices included in TxHAT. Software and supporting documentation can be obtained from the TCEQ by contacting wras@tceq.texas.gov. Texas Hydrologic Information System (TxHIS): The Texas Hydrologic Information System is being built to allow identification of and access to water-related physical, chemical and biological data for Texas through web-published services. Example datasets are available at the link above and include aquatic biology and habitat information collected in support of the TIFP, a subset of data from the Digital Fish Atlas, all records from TCEQ's water quality database, and selected coastal water quality observations. Sabine Basin Literature Review: This literature review of existing environmental flows related reports can be obtained from the TCEQ by e-mailing wras@tceq.texas.gov. Citations Database and GIS Framework, Lower Sabine Priority Instream Flow Program, May 2005: This database contains a compilation of a list of existing historical information and reports related to the hydrology, biology, and physical habitat of the Lower Sabine River. Items on the list are tagged by key word as well and geographic location. This database can be obtained from the TWDB by contacting Mark Wentzel. Baseline Fish Collections, Lower Sabine River Priority Instream Flow Study, February 2007: Baseline biological (fish) data collected from eight sites (six main stem and two tributary) in the Lower Sabine Basin. Assessment of Hydrologic Alteration Software, October 2006: This project assessed the applicability of the Nature Conservancy's Indicators of Hydrologic Alteration software for use in the Texas Instream Flow Program and compared to similar tools, such as the US Geological Survey's Hydrologic Assessment Tool. Final Report: Senate Bill 1639 78th Legislature, Science Advisory Committee Report on Water for Environmental Flows, October 26, 2004. Prepared for Study Commission on Water for Environmental Flows. Interim Report to 79th Legislature: Joint Committee on the Study Commission on Water for Environmental Flows, December 2004. TPWD River Studies: The following link brings you to scientific reports produced by the River Studies Team, an interdisciplinary river and stream assessment program within the Inland Fisheries Division. Its primary goal is to assure sufficient quantity and quality of water to maintain the natural biodiversity of aquatic ecosystems and their associated wetlands and riparian lands. The River Studies Team works to characterize aquatic ecosystems, evaluate impacts to those systems, and determine water quantity and quality needs to address policy and regulatory issues. USGS Data Series Reports: Abstracts and downloadable reports can be found by following the links below.